[2015.12.5] 气候变化高举环保大旗 - 中国 - ECO中文网 - Powered by Discuz! 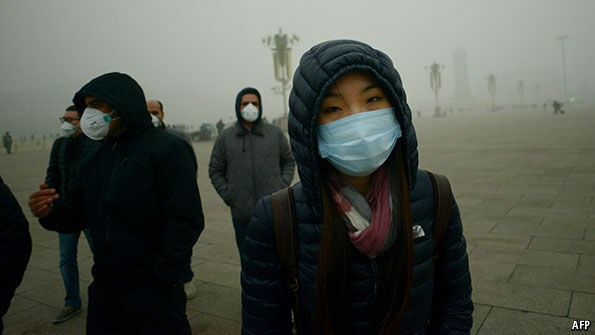 1 WHEN world leaders gathered in Paris to discuss cutting planet-heating emissions, a pall of smog hung over Beijing. In parts of the capital levels of fine particulate matter reached 30 times the limit deemed safe. Though air pollution and climate change are different things, Chinese citydwellers think of them in the same, poisoned breath. The murky skies seemed irreconcilable with the bright intentions promised in France. 2 Yet a marked change has taken place in China’s official thinking. Where once China viewed international climate talks as a conspiracy to constrain its economy, it now sees a global agreement as helpful to its own development. 3 China accounts for two-thirds of the world’s increase in the carbon dioxide emitted since 2000. It has come a long way in recognising the problem. When China first joined international climate talks, the environment was just a minor branch of foreign policy. The ministry for environmental protection had no policymaking powers until 2008. Only in 2012 did public pressure force cities to publish air-pollution data. 4 Yet today China pledges to cap carbon emissions by 2030 (reversing its former position that, as a developing power, it should not be bound to an absolute reduction); and it says it will cut its carbon intensity (that is, emissions per unit of GDP) by a fifth, as well as increase by the same amount the electricity generated from sources other than fossil fuels. The latest five-year plan, a blueprint for the Communist Party’s intentions that was unveiled last month, contains clear policy prescriptions for making economic development more environmentally friendly. 5 Right after the Paris summit, however it ends, China is expected to make more promises in a new document, co-written by international experts, that presents a far-reaching programme of how China should clean up its act. It is based on models that account for both economic and political viability. On top of existing plans, such as launching a national emissions-trading scheme in 2017, the government may even outline proposals for a carbon tax, something that has eluded many prosperous countries in the West. 6 The big question is why China is now so serious about climate change. The answer is not that Communist leaders are newly converted econuts. Rather, they want to use environmental concerns to rally domestic support for difficult reforms that would sustain growth in the coming decades. Since a global slowdown in 2008 it has become clear that to continue growing, China must move its economy away from construction and energy-intensive industry towards services. At the same time, China faces an energy crunch. For instance, in recent years China has been a net importer of coal, which generates two-thirds of China’s electricity. It all argues for growth plans that involve less carbon. 7 This is where signing international accords, such as the one hoped for in Paris, come in, for they will help the government fight entrenched interests at home. Observers see a parallel with China’s joining the World Trade Organisation in 2001. It allowed leaders to push through internal economic reform against fierce domestic opposition. In the same way, a global climate treaty should help it take tough measures for restructuring the economy. 8 It will not be easy. Provincial party bosses and state-owned enterprises hate to shut factories, particularly in those parts of the country, such as Shanxi and Inner Mongolia in the north, where coal is a big employer. Cutting demand for energy is even harder. Even if the amount of electricity used by state industry falls, that used by private firms and households is bound to increase. What is more, environmental regulations and laws laid down by the centre are routinely flouted. 9 But cleaning up China’s act has, for the central government, become a political necessity too. Environmental issues have been major public concerns for over a decade, says Anthony Saich of Harvard University, which has conducted polls. True, rural people fret most (and with good reason) about water pollution. But those in the cities gripe about their toxic air. Both represent a reproach to the government over its neglect of people’s lives and health. 10 That is why national economic goals, political goals, public opinion and international pressure all point towards trying to cut emissions, pollutants included. In particular, says Zhang Zhongxiang of Tianjin University, now that dealing with climate change is a pillar of China’s diplomacy, the government must show it can keep its promises. It has some tools at its disposal. Across the country, the environmental record of government officials has become a crucial part of their evaluation by the Communist Party; and cadres will be held accountable for their actions even after leaving their position. Several provinces have already punished officials for environmental accidents and for not enforcing environmental laws. 11 But there are obstacles to real change. The electricity grid and national power market are ill-equipped to increase renewable generation by much. Corruption in industrial procurement remains widespread, which does nothing to promote long-term efficiency or reductions in emissions. Competing incentives are also in play: earlier this year, the authorities forced a big Chinese investment company to buy back shares it had sold in old-fashioned industrial fields, for fear that it might depress share prices (which crashed anyway in a more general stockmarket meltdown). The government will not trust market mechanisms alone, says Yang Fuqiang of the Natural Resources Defense Council, an activist group. 12 Nor are leaders yet pushing for change on all fronts. For instance, government efforts to cut emissions of carbon dioxide and nitrous oxide are greater than for many other greenhouse gases. Scarce and polluted water, one of China’s most severe environmental challenges, is almost entirely beyond the scope of the current raft of reforms. 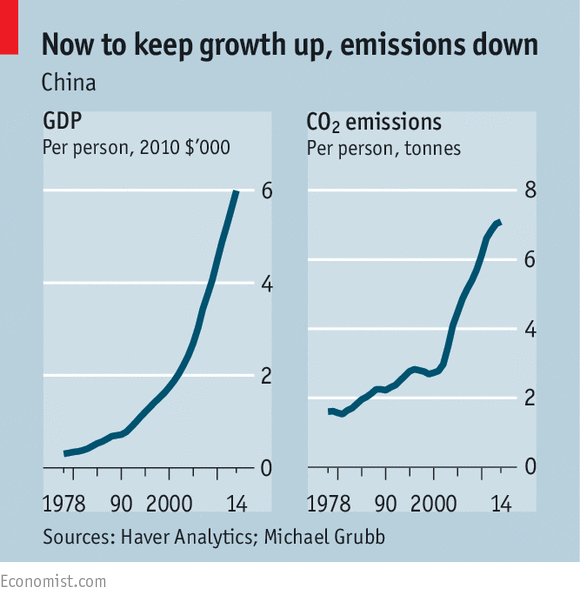 And China refuses to publish its estimate of the environmental toll of economic growth. 13 Sceptics scoff that China’s promises in Paris are irrelevant because emissions will probably peak regardless, long before the promised 2030. Nor has the government said how high that top might be. Yet the sceptics underestimate the importance of an international agreement for China and beyond. Like other countries, China has to date followed a pattern of “grow first, clean up later”. Yet very quickly it has recognised the dangers and drawbacks of such a policy and has been pouring money into clean energy and other innovations it hopes will provide green growth. In that, it may prove a model for other fast-developing countries. That might signal a small patch of blue sky. GMT+8, 2019-4-21 04:29 , Processed in 0.074818 second(s), 26 queries .